The Hofwaldschlut is a former course of the river Murg which has nearly completely silted apart from an oxbow lake in the estuary to the Riedkanal. Below the bridge of a country lane an opening of the Riedkanal will be created and water will be led again into the Hofwaldschlut. The allocation of the water to the Riedkanal and to the Hofwaldschlut wil be controlled with a barrier in the Riedkanal. 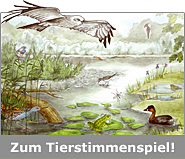 Additionally, in the Hofwaldschlut small water bodies will be digged for amphibians, and the passage under the street between Plittersdorf and Steinmauern will be extended. The dredging works will be conducted in late summer or autumn of the next years.
" typeof= After the works have finished water will flow again in the Hofwaldschlut, and water plants, fish (e.g. spined loach) can settle in the new habitats. In the close surroundings tall herb communities will develop and on the long term riparian forests will grow. Finally the measures also comprise the development of species-rich meadows which may include flood plants for the dusky large blue.